Selja Ahava’s Things that Fall from the Sky has been sold to Editorial Bercimuel in Spain and to Relacja in Poland. Editorial Bercimuel is a publisher focused on the titles of past and present women authors, many of them also highly awarded for their work. They are the publishers of for example Emilia Pardo Bazan, Germaine Greer and Frida Kahlo. Relacja is a Polish publishg house that together with Mamania forms Publishing Group Relacja. They publish a variety of fiction, non-fiction and children’s and ya titles. 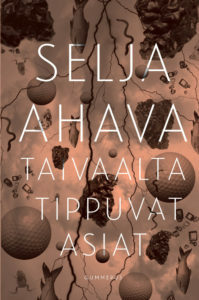 Selja Ahava’s Things that Fall from the Sky received the European Union Prize for Literature in 2016, and it has been so far sold to 15 countries. Here we come, China! Helsinki Literary Agency will be in Beijing 21st – 26th August, taking part to the international book fair. You’ll find us at the Nordic collective stand, E1.C10. See you there!